Disabled parking spots are only useful if other drivers resist the urge to use them. We recently wrote about Brazil’s disability awareness tickets, which enabled the citizens of Sao Paulo to print and issue warning parking tickets to any cars wrongly parked in a disabled space. 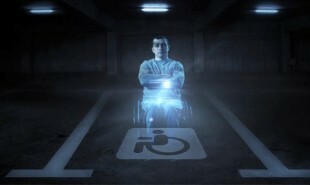 Now at one Russian mall, the non-profit Dislife is using projections of real disabled people to ward off people who try to take disabled spaces. More than 30 percent of drivers in Russia currently fail to comply with the parking regulations concerning disabled spaces. How else could projections be used to remind citizens to be more considerate of others?